Since retirement I have been giving myself a birthday present annually by traveling south of the Equator to discover a country unknown to me. 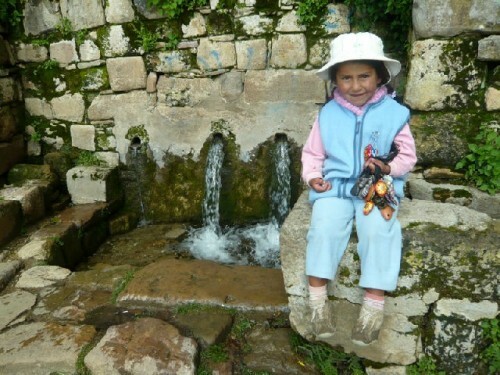 This year my present was a trip to Bolivia and Colombia, both of which I enjoyed immensely. Dragging my luggage over a sheet of ice in my driveway early one February morning, I made my way to the cab waiting at the curb. 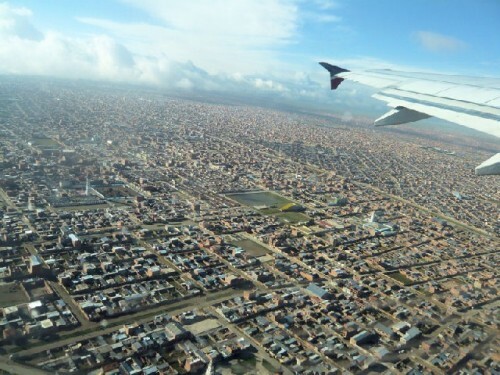 Hoping to beat a predicted snow storm in Boston, I began the first leg of my long journey to Miami, then to Lima, and finally La Paz, Bolivia. 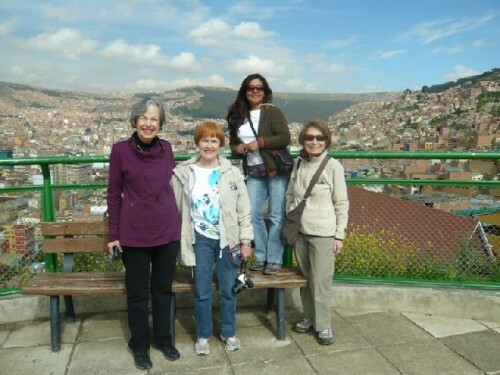 Seven of us — two couples and three solo travelers — had signed up for a pre-trip extension to visit Colombia’s Colonial Jewels and the Coffee Triangle, an itinerary offered by Overseas Adventure Travel. Coming from different parts of the United States, the group met at the Miami airport. Moving our watches one hour ahead, we arrived in La Paz at 12:30 am. 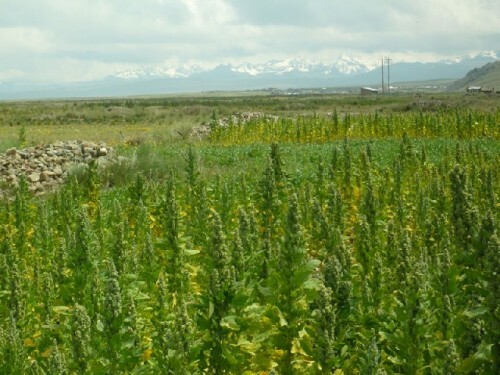 In preparation for landing at 13,000 feet, I had started taking altitude pills a day in advance. We cleared security after a lengthy wait in slow-moving lines due to required paper work. Despite the several flight changes, my luggage arrived on the carousel, much to my relief. 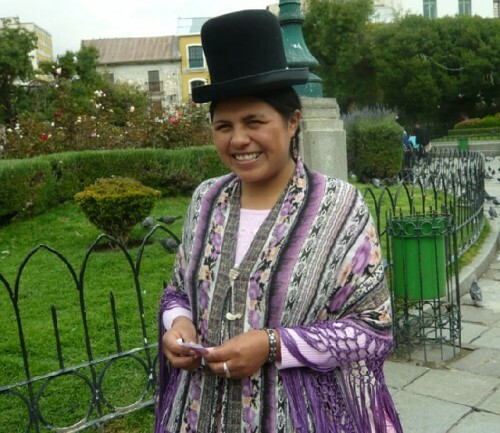 Wendy, our guide, an Aymara beauty with dark complexion, welcomed us with a big smile. 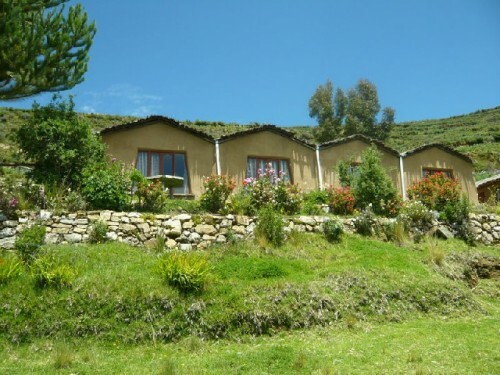 Riding over bumpy roads in a van for about 45 minutes, we descended 1200 feet from the airport to La Paz, which sits at the foot of the Andes at an altitude of 11,800 feet. We arrived at the Radisson Plaza hotel at 2 am. Exhausted from the long journey, I dropped off to sleep soon after receiving my room key. 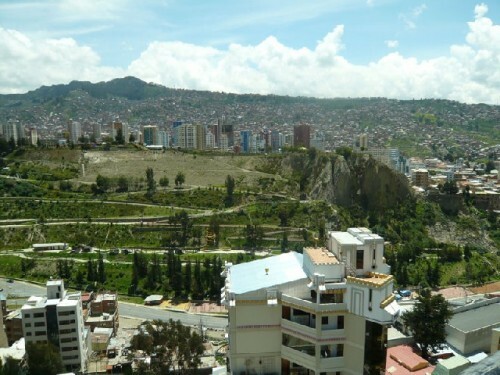 In the morning I was able to appreciate the view out the window of my corner room overlooking a lush green park surrounded by tall buildings, behind which brick houses covered the picturesque hillside. 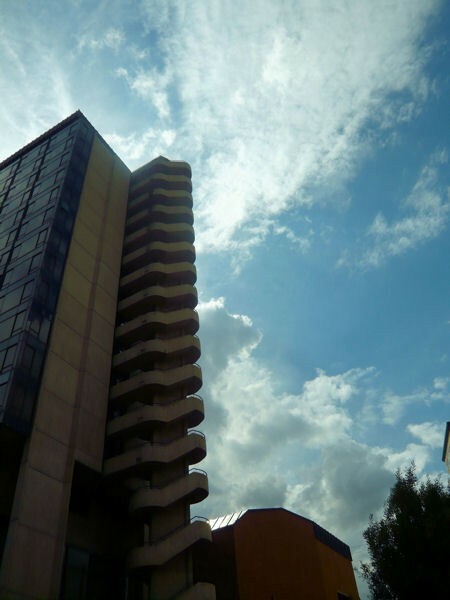 The spiraling balconies on the exterior of the 15-story hotel revealed other spectacular views. 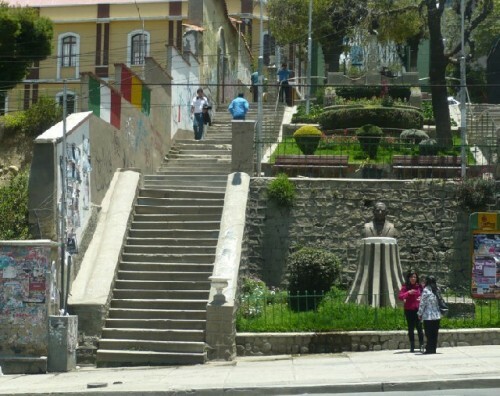 A walk in the vicinity led to parks and plazas, many with heroic statues commemorating local heroes from wars against the Spanish or Peruvians. 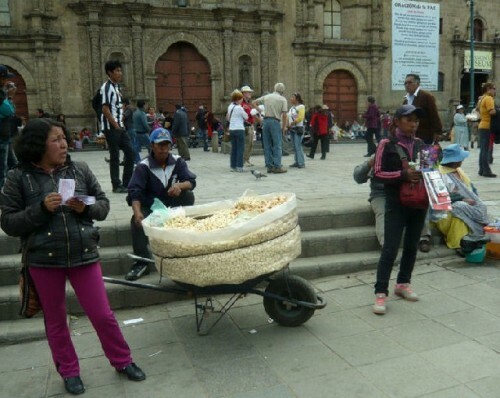 Stepped streets bustled with people used to conducting their daily lives in tiered shops or dwellings. 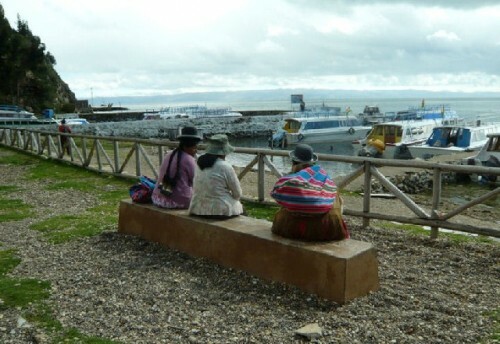 Andean women wrapped in fringed shawls and wearing colorful multi-layered skirts over a petticoat, some in bowler hats, went about their business. 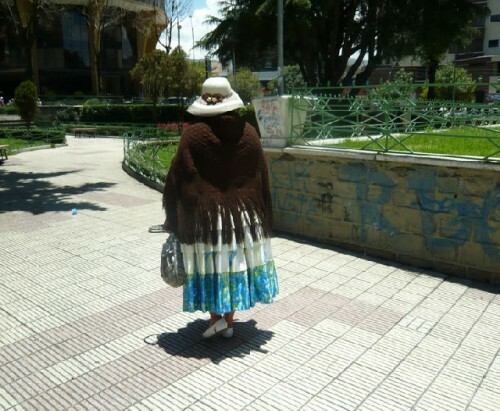 The colors of the clothing women and men wore indicated the regions they came from. 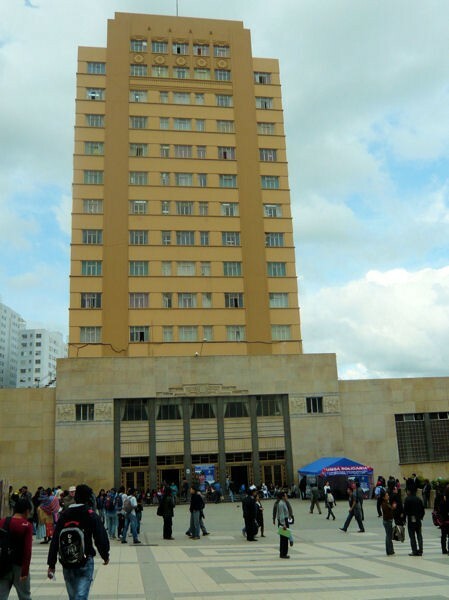 In the afternoon a tour with Wendy expanded our footprint to the Museum of Anthropology, which was closed for restoration, and the university, which admits students choosing an academic over a trade track after six years of compulsory elementary education. 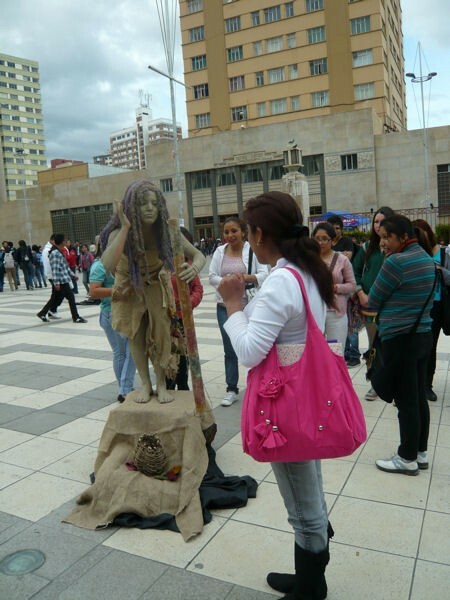 Students, vendors, and street performers enlivened the university’s plaza. We stopped at a sweet shop to try local delicacies, such as cunepe and huminta — the former a pastry made from manioc flour and cheese, the latter made with sweetened cinnamon-flavored cheese wrapped in corn husk. Wendy also treated us to gelato ice cream served over passion fruit. Dinner was back at the hotel restaurant on the 15th floor, where we enjoyed the city’s night-time spectacle. 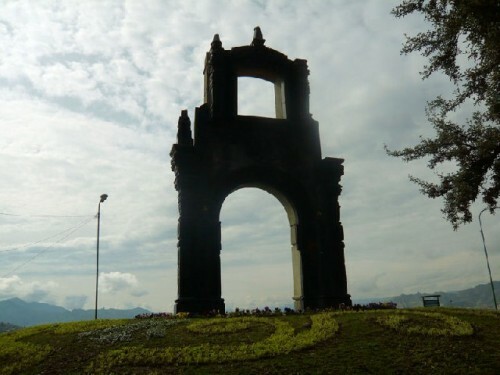 The following day’s tour started at Killi Killi, a scenic hill, centered with a replica of the French Arc de Triomphe, at the northern outskirts of La Paz, a city of 1,200,000 people. 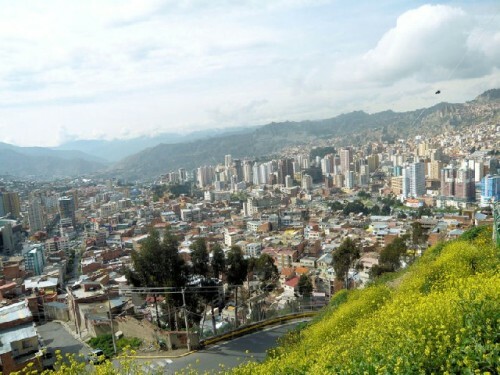 Here the city’s unique mountain-ringed, bowl-shaped topography was in full view — brick dwellings crowding the rim of the rugged Altiplano, surrounding the bustling city center with high-rises below. 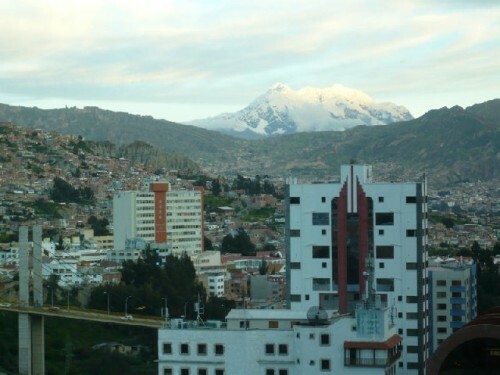 Enjoying the mountain vistas with the snow-capped peaks of towering Illimani, we then descended to the city’s colonial center. 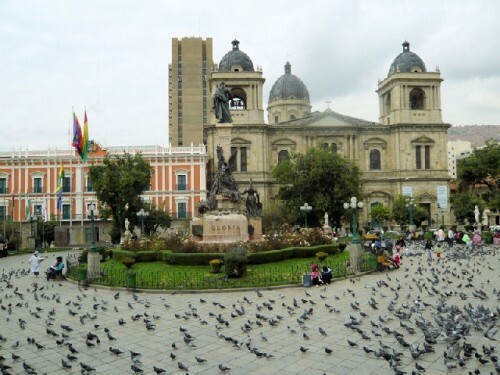 Bolivar Plaza named after the Creole liberator and founding leader of the Republic in 1825, is encircled by an attractive cathedral and government buildings adorned with tricolor Bolivian flags — green for natural resources, yellow for gold, and red for bloodshed during wars. 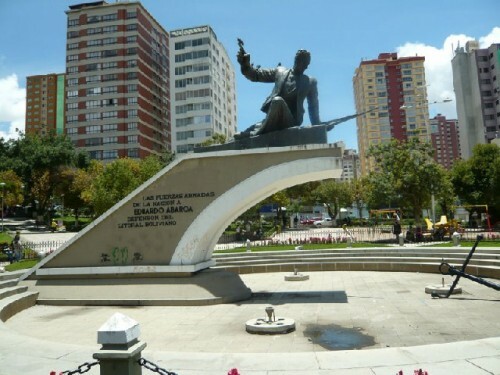 A towering statue of Simon Bolivar, the hero the country derives its name from, stands in the middle of the plaza. 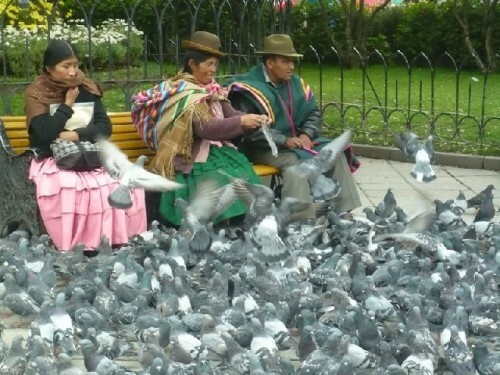 Hundreds of pigeons flutter about, attracted by food people give and contributing to the plaza’s vibrancy. 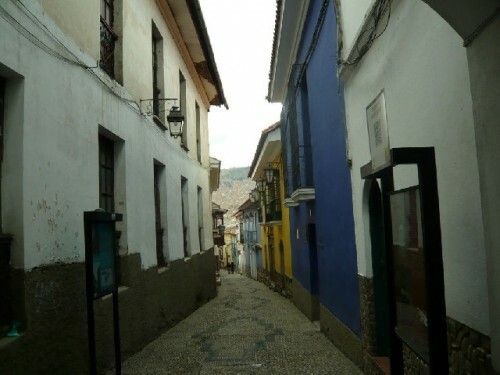 Calle Apolinar Jaen is the city’s oldest street, dating back to the 18th century. 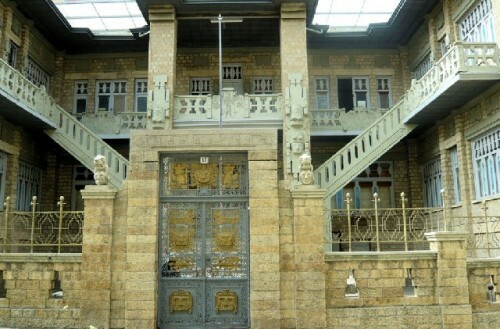 The colonial buildings have been charmingly restored to house artist studios and galleries. 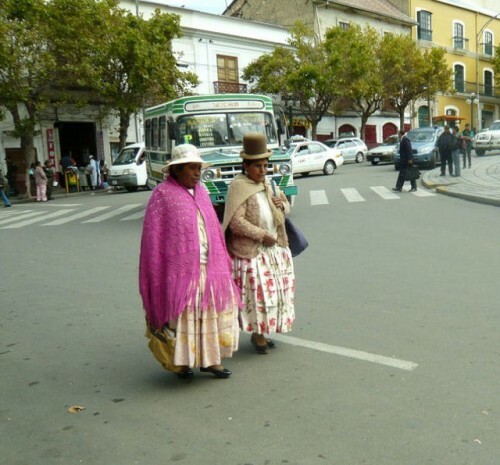 We strolled down this street, visiting some of the artist-run shops, where I made my first purchase — a llama skin necklace etched with stylized animal figures and held together by red Amazon jungle beads. 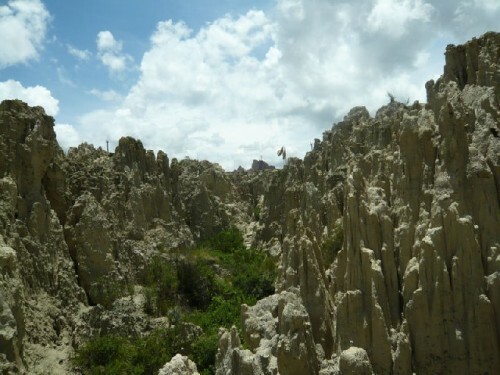 Traveling south toward the affluent neighborhoods, we arrived at the Valley of the Moon — a rugged, fantastic landscape of deep gullies and spindly spires of stone shaped by many years of erosion. A map at the entrance guided visitors to areas with fanciful names inspired by the shapes of the eroded rocks, such as Lady’s Hat and Turtle Hill. 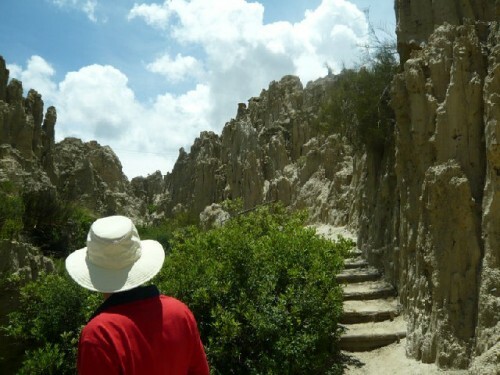 We walked the trails, noting an occasional cactus on our short hike through the valley. Lunch was at an outdoor restaurant in the nearby upscale neighborhood. The set menu consisted of corn soup, catfish accompanied by potatoes, green beans, and red cabbage, and raspberry mousse for dessert. 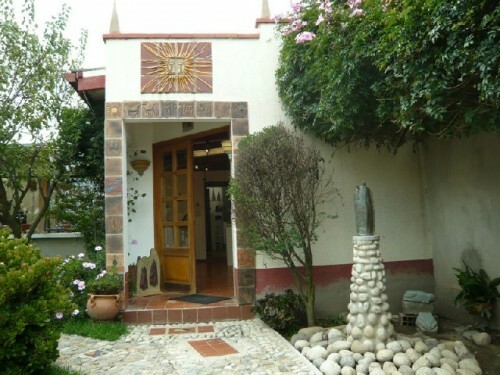 In the same neighborhood we visited the home and studio of a ceramic artist. 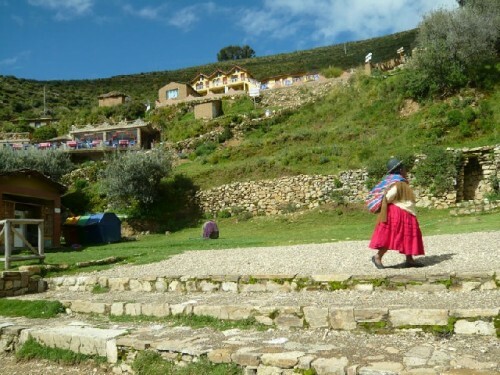 The artist’s Spanish background explained the affluent setting, as most natives live on the crowded hillsides. His ceramic art was beautiful, but pricey. 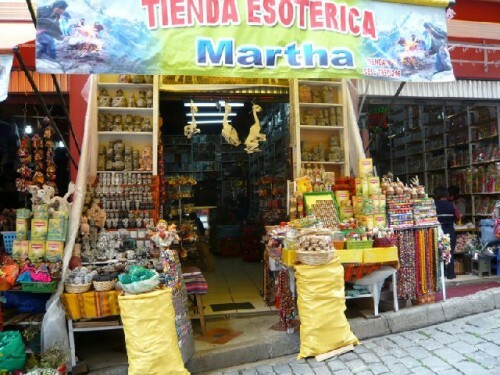 Returning to the city, we visited the Witches’ Market. 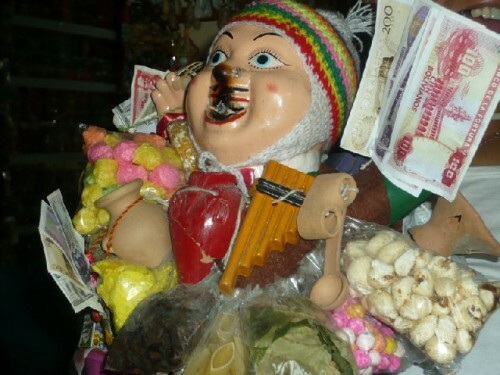 "Witch" was a name given by the Spaniards to the indigenous people, who used herbs for healing, leading to the term "witch doctor". 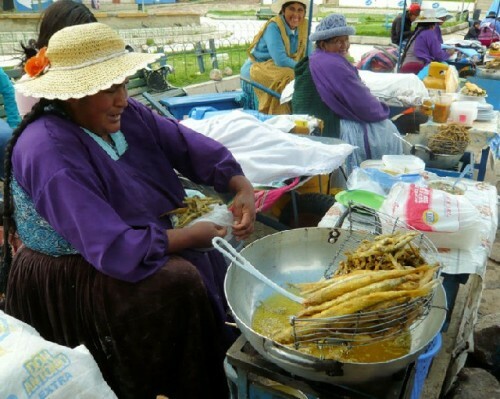 The market was lined with small shops crammed with plants, potions, and talismans used in ancient Aymara healing rituals. 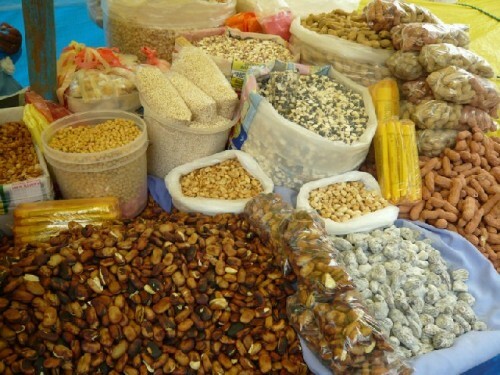 People bought talismans for wealth, education, good health, fertility, etc. I was attracted to a painted ceramic condor, which was a talisman for travel; I bought it instantly. 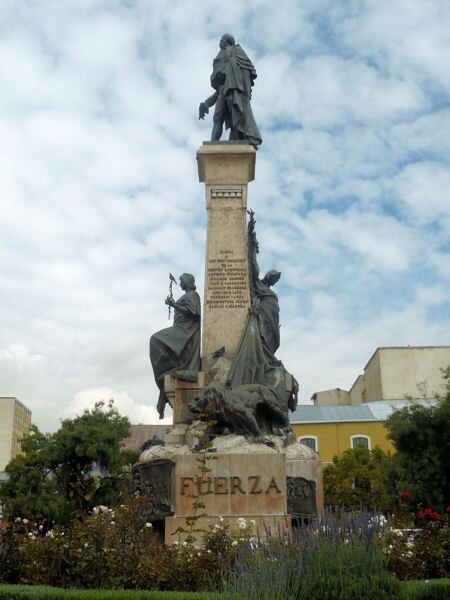 Returning to the hotel by way of Murillo Plaza and San Francisco Church was a challenge for our driver. 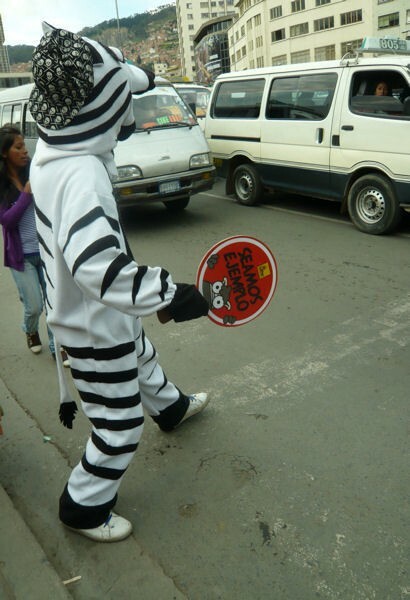 He inched along through congested rush-hour traffic while a zebra-costumed volunteer hired by the city aided the traffic police. We ended our day with dinner on our own. 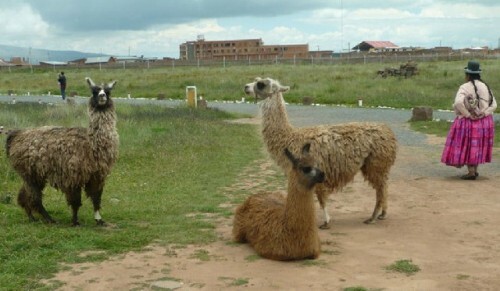 At a nearby restaurant I ordered llama kebab, which came with a generous open buffet. 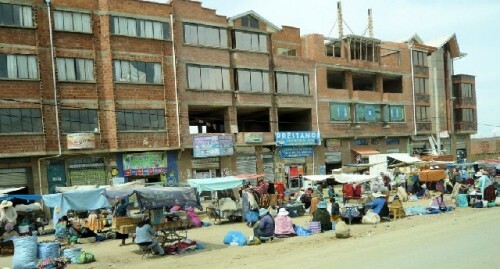 The llama meat was tough; otherwise all was delicious and cost only $13 because of the favorable exchange rate of almost seven boliviano to the dollar. 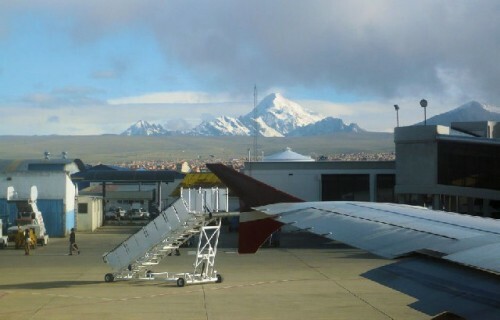 capped Andes in the background. 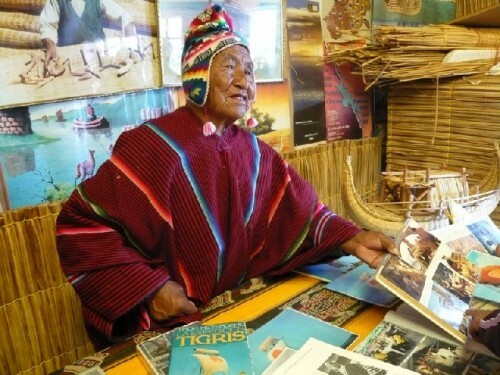 A unique stop on the way was a visit with an indigenous family, who made a living by crafting balsas, traditional boats handcrafted from totora, the marsh reeds that grow in the shallow waters of the lake’s shores. The boats, primarily used for fishing, were originally sealed with animal fat and varnished. Due to their short life-span of a year, they are no longer used in the fishing industry, but only for tourism. 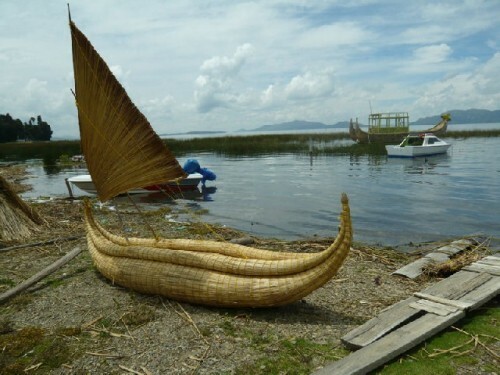 Some of the boats are affixed with sails, also made from reeds. 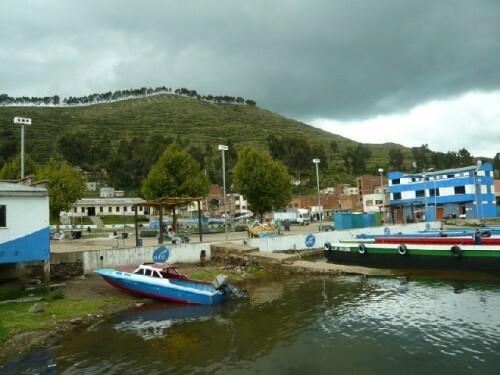 minute boat ride with locals transported us to Tiquina, distinguished by a row of eucalyptus trees planted on top of the hill for protection from the winds. 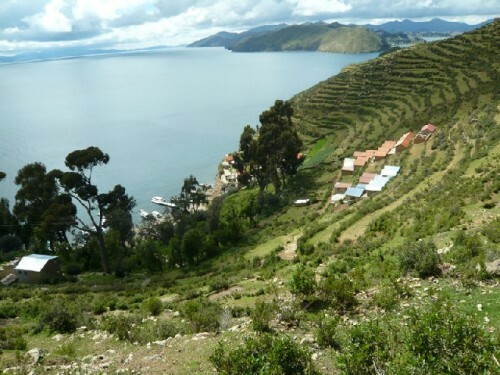 Back on the van, we continued to Copacabana, with striking views of the town below as we descended from 12,500 to 12,000 feet. Clouds loomed over; it began raining. 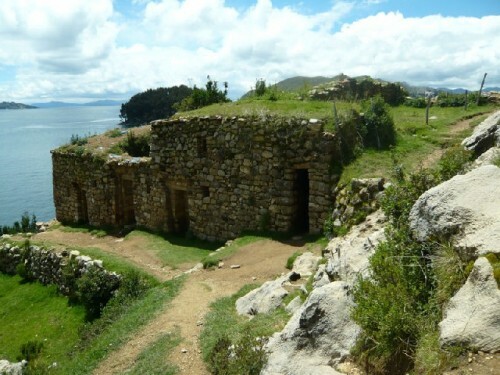 Regardless, we toured the town by foot, starting at the Basilica of Our Lady of Copacabana, built over an Inca temple. 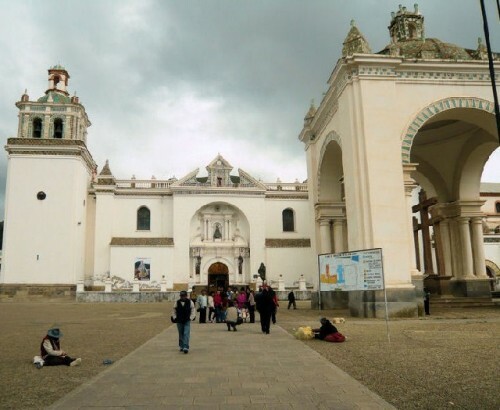 The Basilica, an important pilgrimage site for all Bolivians, is a blend of Spanish and native traditions, such as the Black Virgin with her white face and Andean features, dressed in the triangular shape of the mountain. To accommodate the crowds at services, a new church has been built across the way. 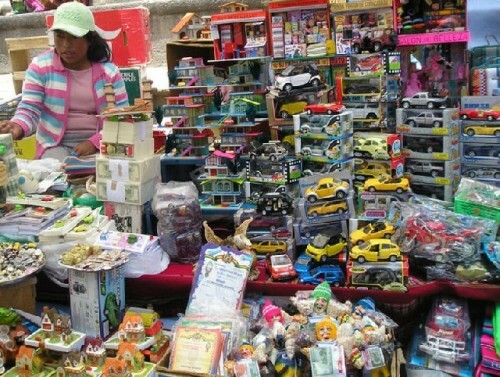 Nearby are vendor stalls crammed with talismans of houses, cars, small dolls, etc. Cars wait in front of the Basilica to be blessed, whereupon they are decorated with flowers. 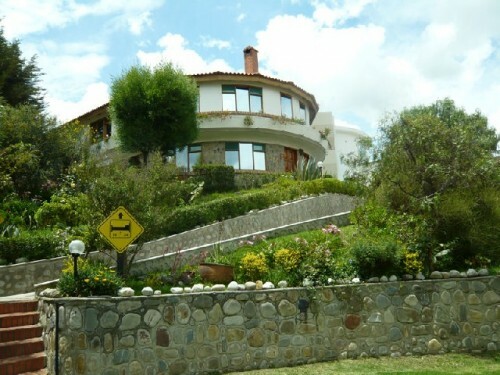 Walking through the market with stops to view unfamiliar items, such as roasted fava beans, we reached the Rosario del Lago hotel, our home for the night on a hill near the shore. 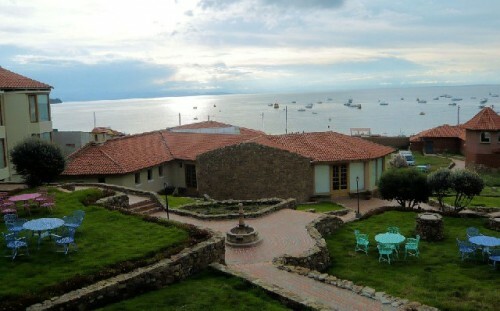 The view from my room of the lake sprinkled with boats shimmering at dusk was enchanting. At dinner we were treated to lake trout in a creamy sauce, followed by crème brulée for dessert — delicious. Calling it a day, we retired to our rooms, looking forward to the next day’s cruise to the Island of the Sun. 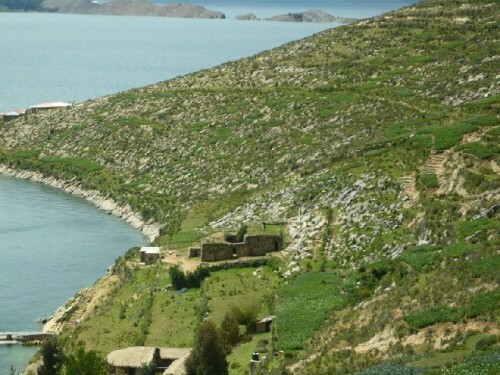 Lake Titicaca, the world’s highest navigable lake, covers more than 3,800 square miles. 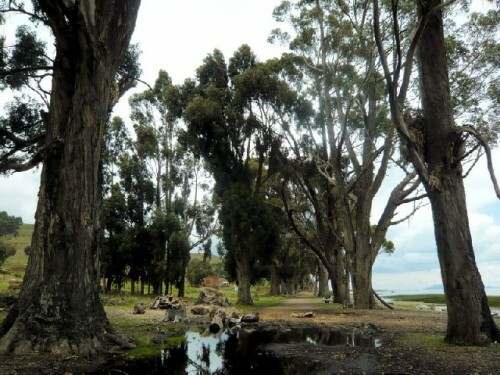 It is divided by an arbitrary line between Bolivia and Peru and is considered a sacred place by the natives, who live around the lake in both countries. 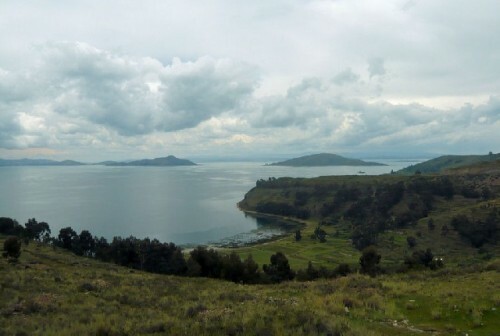 Based on a legend that a pair of gods rose from the waters of the lake to found the Inca Empire, the Isla del Sol (Island of the Sun) and Isla de la Luna (Island of the Moon) are believed to be the sites of this creation. 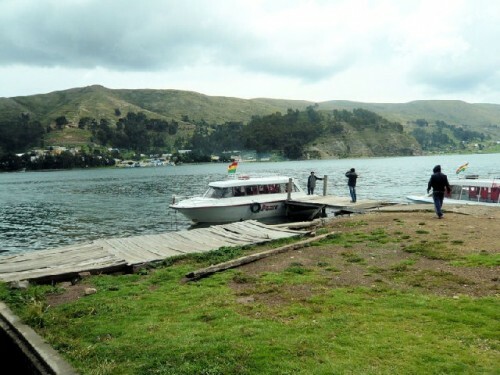 Bouncing on the rough waters of the lake in a catamaran for about 45 minutes, we arrived on the rocky shores of Island of the Sun, which has no motor vehicles or paved roads. 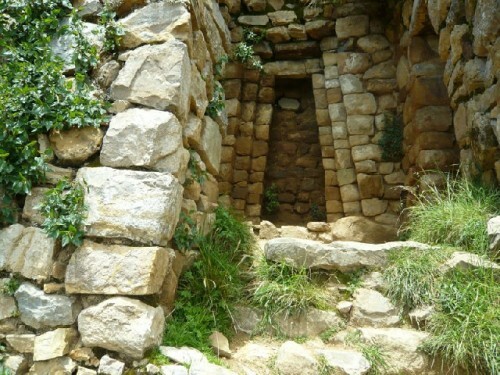 About 3000 natives live in a cluster of villages of mostly mud-brick houses on terraced hills and negotiate steep stairs to reach their dwellings. They use donkeys for transporting goods. 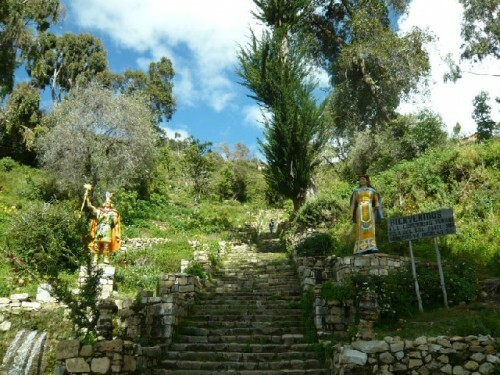 Statues of the first leaders of the Inca Empire — Manco Kapac and Mama Ocllo – welcomed us to the Yumani community at the entrance of a 300-step climb, followed by a steep walk to the hilltop village. 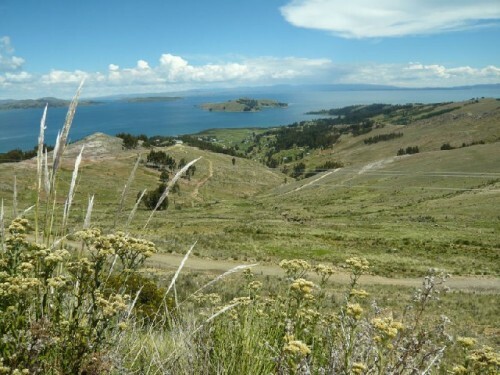 The views of the lake and terraced hills became increasingly stunning as we climbed. A little girl charmed me into buying one of her ceramic whistles, painted with the Pacha Mama (Mother Earth) image. 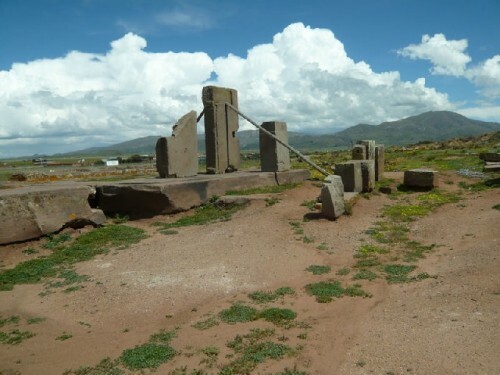 Walking along a dirt path by fava and potato fields with white and purple flowers, corresponding to the color of potato they produced, we reached the archaeological site of Pilko Kaina, an ancient Aymara sun temple, predating Inca time. Still visited by locals every June 21st during the winter solstice, the temple has a trapezoid-shaped entrance for offerings. 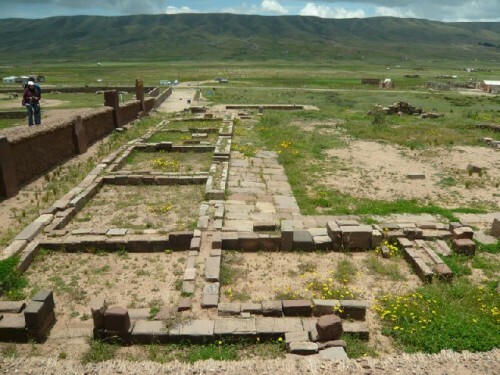 Smoke stains on the wall indicate that the first floor was once used as a kitchen.The second story is in ruins and inaccessible. 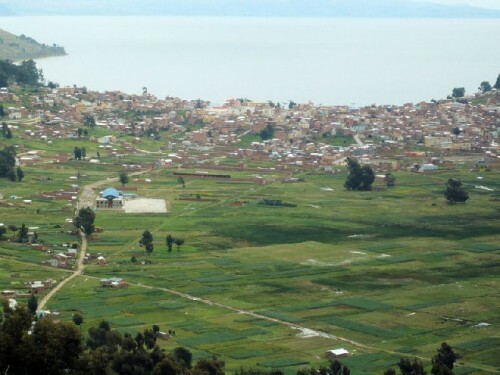 Continuing to take in stunning views of the lush fields, the lake, the Island of the Moon and the mountains beyond, we walked to a hostel, run by locals, for lunch. 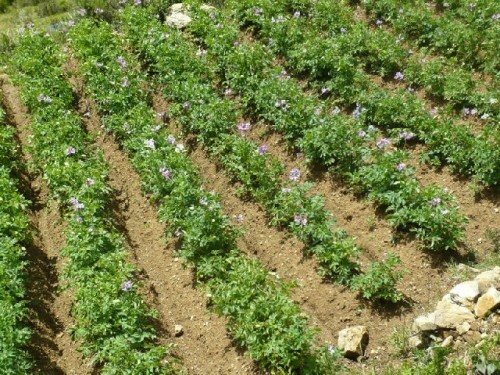 There we were treated to a variety of home-prepared foods, including produce from nearby fields. 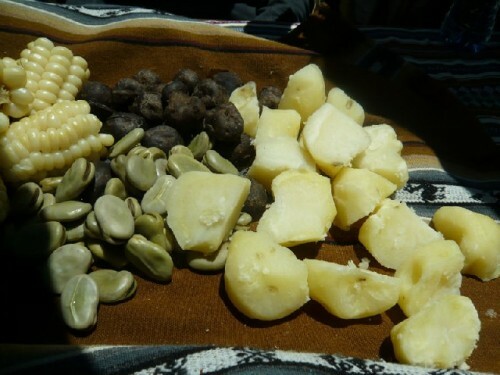 Steaming corn, fava beans, and purple and white potatoes arrived bundled in a big cloth and placed in the center of the table for us to help ourselves. Small chunks of fried chicken, big and little crisp lake fish, hard boiled eggs, white cheese, and a variety of fruit complemented the hardy farmer’s meal. 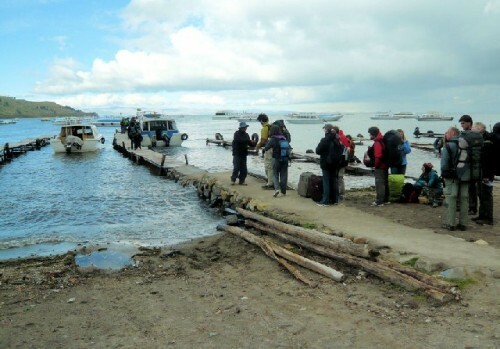 Descending to the shore, we took the catamaran back to Copacabana, where we met our driver to return to La Paz. 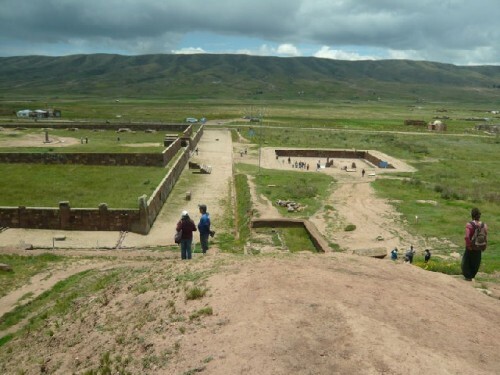 The scenic trip, with views of rolling hills and grazing sheep, changed to brick houses, roadside vendors, and increasingly congested traffic as we approached the city. 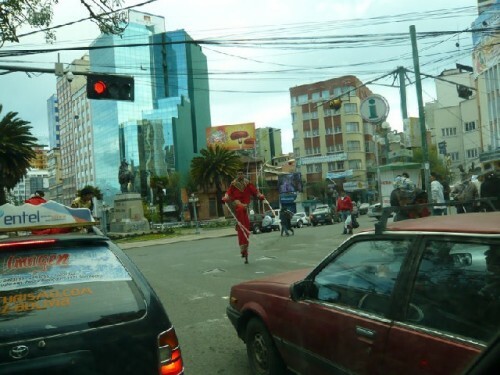 Costumed stilt-walkers entertained drivers waiting at traffic lights. 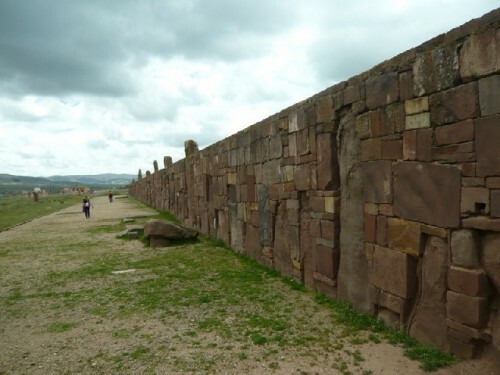 We returned to the Radisson Plaza in anticipation of our last day’s adventure to Tiwanaku, Bolivia’s most important archaeological site. 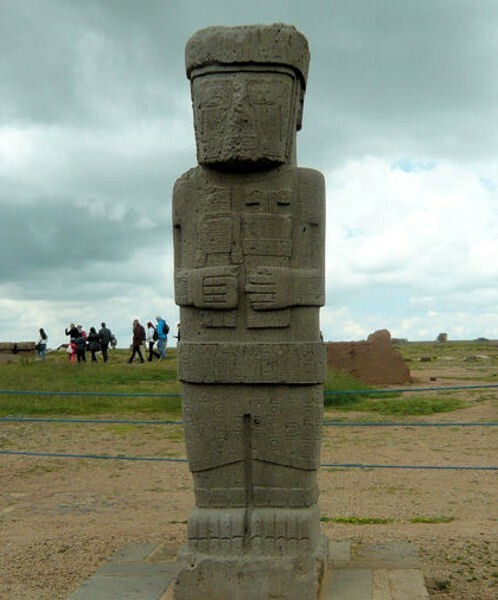 A UNESCO World Heritage Site, Tiwanaku is an ancient ceremonial location with several temples on the southern shore of Lake Titicaca, dating back to 600 BC. 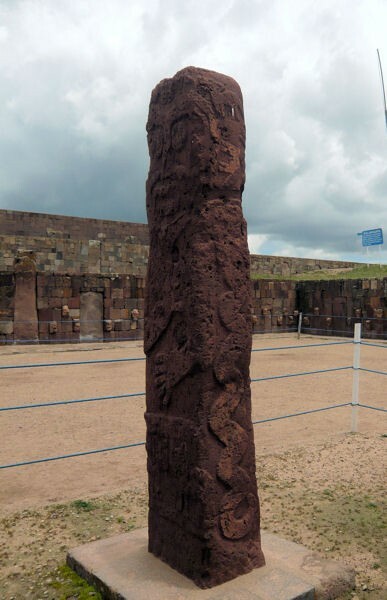 The Kalasasaya Temple (Temple of the Standing Stones) in Aymara is a large dawn-sunset-oriented structure with sandstone pillars protruding from its rectangular walls. 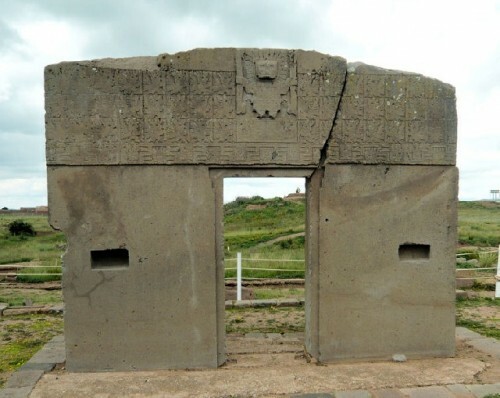 In its northern corner is the Gateway to the Sun, with decorative carvings indicating that it might have been used as a solar calendar. 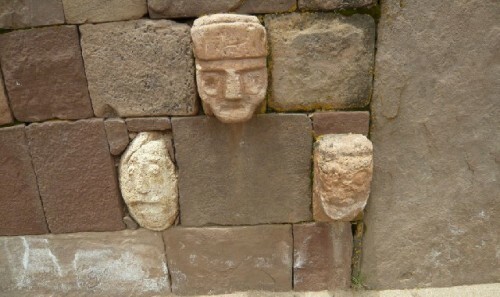 Below the surrounding soil level to the east are the Semi-Underground Temple, with 175 embedded limestone heads in its four walls, and three monoliths with high-relief iconography at the center of the courtyard. 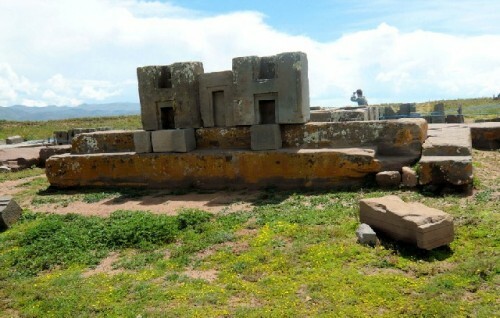 Puma Punku, the Door of the Puma, is a colossal temple construction which utilizes a unique brass staple bonding technique. It has three platforms and at the top a sunken courtyard with a paved floor and canals to channel rain water. 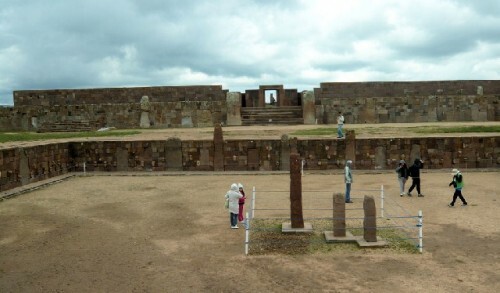 The massive stone slabs provide a vantage point for looking out over the surrounding plains. 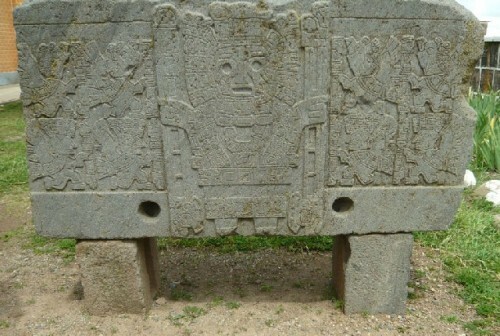 The archaeological complex has two museums. 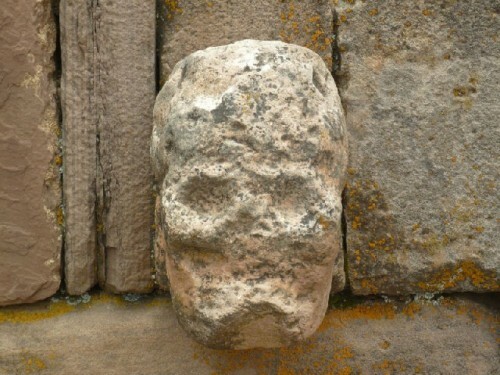 The Ceramic Museum is home to artifacts of the lost culture. 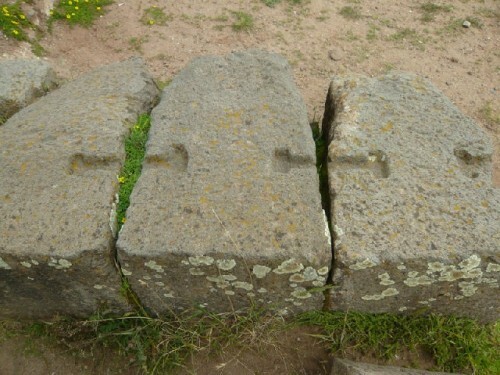 The Lytic Museum houses large stone objects, including monoliths found at the temples, to protect them from flood waters during the rainy season. 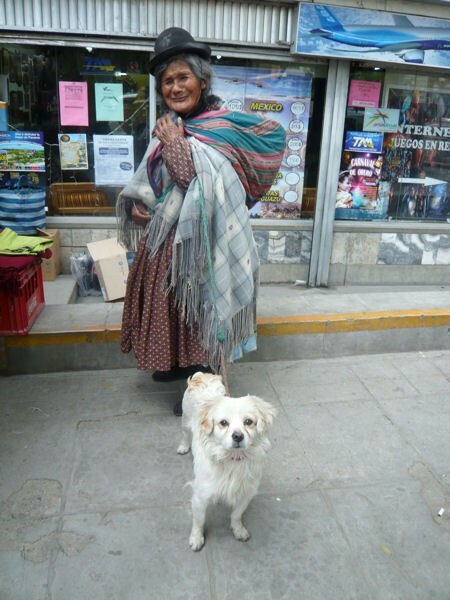 At the end of a fascinating day, which included a family of llamas as we exited the site, we returned to La Paz. Our farewell dinner included a delicious salad of avocado, palm hearts, tomatoes, and a Bolivian version of chicken Stroganoff. The meal ended with a surprise birthday cake — for me, who else, as my birthday was the next day. To make sure my birthday was properly recognized before I left Bolivia, Wendy had arranged for a cake to be delivered to our table. It arrived with a trick candle, unbeknownst to me. I had to blow hard three times before I realized the trick. A delightful ending to a delightful trip!